One panorama from the Panoramas gallery. Click for more. What to do when it’s pouring rain? 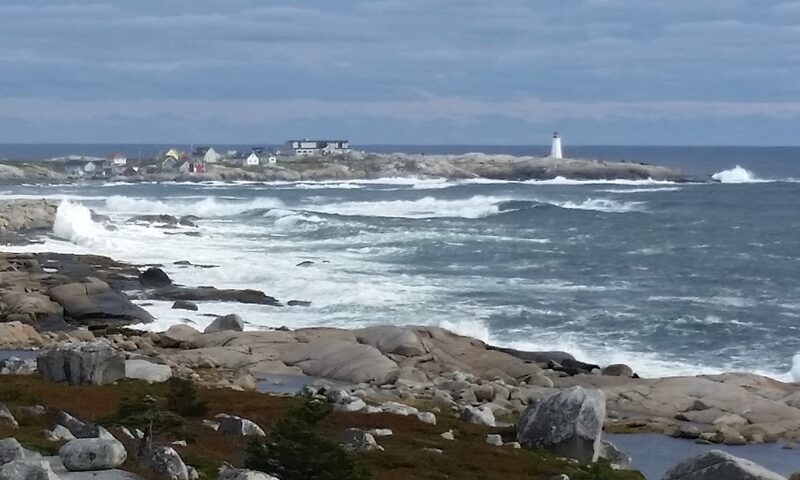 Get new photos into the Nova Scotia Photo Album, of course. 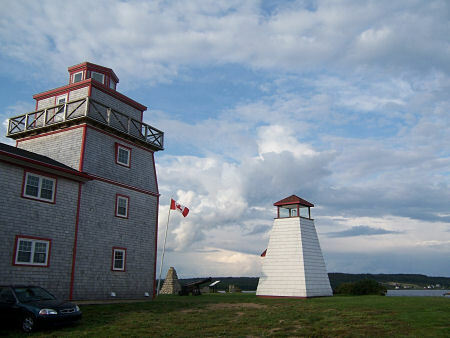 I just uploaded several new Panoramas and fleshed out the Annapolis Valley section. I’ve been lucky to be able to explore the LaHave River and the LaHave Islands by car, sailboat, dinghy and on foot. It is a very special area. Samuel de Champlain was impressed enough with it when his ship landed in Green Bay in 1604, on their way to Port Royal, to encourage the king of France to establish it as the first capital of New France. And in 1632, Louis XII’s orders to do so were carried out by the Viceroy, Isaac de Razilly. Fort Point Museum at the mouth of the LaHave River, site of Razilly's original fort. Click photo to see more pictures of the LaHave River and LaHave Islands. Panoramas: Note that each panorama is stitched together from two or more photos to give a wide view, more like the eye sees as it scans the scenery. Together they form an extremely unique collection of images from around Nova Scotia. Halifax – I confess, I’ve only ever lived in Halifax for a summer long ago, so I’m a tourist when I go to Halifax, even if it’s to see a doctor. So much the better for you if you’re planning a trip. Blue Rocks & Stonehurst – Not far away from us, but so very picturesque, and a fantasy place for kayaks and other small boats. I’ve just added 5 new Nova Scotia panoramas to the Photo Album, as well as a few pictures in the Mahone Bay, South Shore, Fundy Shore and Blomidon sections. More pictures are on their way. I think I’ll break out a new section on the LaHave River and Islands, and create another just for islands, mostly from a boater’s perspective. Could be useful to someone trying to figure out where they are! 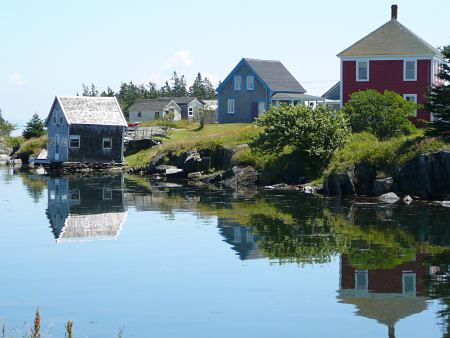 This project, the Nova Scotia Photo Album, is still very much alive and growing. It predates Flickr, Picasa and the rest. Photo sharing has become an easy and common thing for anyone to do, so I hope I’m offer something of value. Is it just because this site has been around for a long time and gets found in the search engines? What do you think? Click on COMMENTS below and leave a comment. I was in the Annapolis Valley last week on a beautiful spring day, and have added some panoramas to the Photo Album. I’ve just set up a new section of the photo album called “Chirbles the Chickadee, his Friends and his Enemies”. It features the nature photography of the “Chickadee Dude”, Dennis Robinson. He has a special relationship with his chickadees and loves to capture their personalities with his camera. Some of these photos of Nova Scotia birds are available on various products such as postcards and notecards in our Nova Scotia Gift Shop. Look for Chirbles. After a beautiful day in the LaHave-Green Bay area I’ve posted a few new photos to Oceanside and a couple of new panoramas. 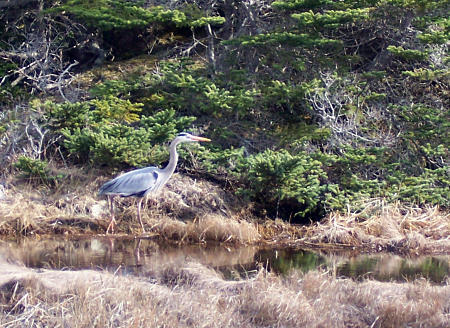 We saw this Great Blue Heron on Bush Island, in the LaHave Islands chain.